Today you woke up with an alarm bell ringing in the back of your mind that said WHAT THE BLOODY HELL IS THIS JSON THING AND WHY IS IT EVERYWHERE ALL OF A BLOODY SUDDEN! Well I had a slow bus ride home tonight (friday is always slow) and i took a pile of "JSON" tutorials with me. So now I can gently lead you through some BabySteps in JSON. 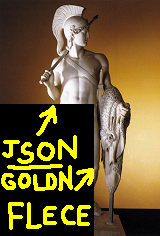 What does JSON stand for? JSON is a syntax for passing around objects that contain name/value pairs, arrays and other objects. Names and values are separated by a colon. XML uses angle brackets, with a tag name at the start and end of an element: JSON uses squiggly brackets with the name only at the beginning of the element. JSON is less verbose so it's definitely quicker for humans to write, and probably quicker for us to read. But Why? What's good about it? When you're writing ajax stuff, if you use JSON, then you avoid hand-writing xml. This is quicker. bring back a JSON string. So this is Object-Oriented huh? JSON is about as object oriented as VB6. It provides a nice encapsulation technique, that you can use for separating values and functions out, but it doesn't provide anything inheritence, polymorphism, interfaces, or OO goodness like that. And it's just for the client-side right? Yes and no. On the server-side you can easily serialize/deserialize your objects to/from JSON. For .net programmers you can use libraries like Json.net to do this automatically for you (using reflection i assume), or you can generate your own custom code to perform it even faster on a case by case basis. As near as a I can tell, JSON was invented by a guy called Douglas Crockford. Read his website if you want, he's pretty funny. I've only tinkered with this stuff for a few minutes -- so I've probably said some completely wrong things. If so, please leave a comment, telling me what an idiot i am. I'll be happy to correct any specific mistakes. Best of luck!